Briggs Pendant 60-in White Porcelain Enameled Steel Rectangular Left-Hand Drain 255880. Small scratch on RH back corner Otherwise in nice condition. Porcelain-enameled steel is glossy and durable, making it easy to clean. 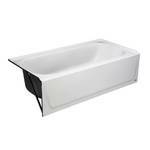 60-in L x 30-in W x 14.25-in H skirted bathtub. Slip-resistant tub floor promotes safety when entering and exiting. 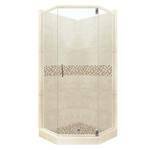 Basco Classic 60-in W x 57-in H Frameless Bathtub Door, 3400A-60CLOR - New never installed and in nice condition. Dreamline SlimLine 48 in. W x 34 in. 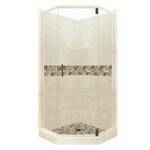 D Single Threshold Center Drain Shower Base in White, DLT-1134480. Never installed - New. SlipGrip textured floor surface offers slip resistance for safety. Glossy acrylic finish safeguards against stains for easy maintenance. Drain opening fits standard 2 in. compression fitted drains (drain not included). 2-3/4 in. Threshold. White 24" Vanity with Gray Stone Top - USED with Damaged Shelf. White 24" Vanity with Gray Stone Top - USED with Damaged Shelf. Measures 24" X 22" X 35" Tall. Bored Top, Bottom Soft-close drawer. Vanity base shelf has been cut and has a large hole. Nice Vanity, but needs some TLC. Other small chips and scratches. See Photos.